This classical masterpiece is made from ceramics and authentically crafted to impress. Military Wealth God is very popular among tycoons and businessmen in Asia. His looks are more confident, grandeur and victorious compared to other Wealth Gods. 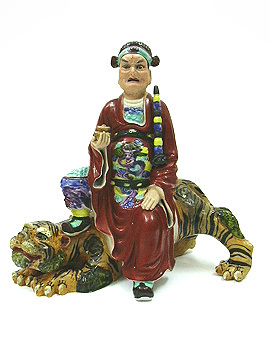 He sits on a ferocious tiger, thus making him having extremely powerful command on wealth. He carries a gold ingot and a multilevel military varja weapon. The magical varja weapon enables him to punish all evils and to destroy all ignorance that could lead to being cheated. The tiger swallows every evil that goes near it. This item is most suitable for homes, mansions, business premises, lobbies, receptions and cashiers. This beautifully crafted classical piece is hard to get and is highly recommended for those who want to seriously multiply their wealth, businesses and income luck. This masterpiece would make a great gift for passionate antique collectors as well. Note: Every piece is uniquely handmade and comes in slightly different color and facial gestures. Extraordinary taste and classical looks! What Military Wealth God symbolizes and how to place this deity? 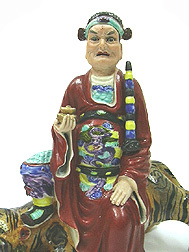 Military God of Wealth (General Zhao Kong Ming) is one of the five Wealth Gods (Chai Shen Yeh) who gives powerful blessing of good fortune for those doing businesses and taking them seriously. In Chinese folklore, there are five Gods of Wealth; Civil God of Wealth, Military God of Wealth, Rich God of Wealth, Righteous God of Wealth and God of Windfall. They take turns to handle financial matters among the people. The Chinese prefer Military God of Wealth because of his confidence, grandeur and victory expression. His presence had benefitted many tycoons in Hong Kong, Taiwan and Southeast Asia. Zhao Kong Ming was once a famous general in ancient China. Knowing that he is a righteous, honest and just man, the heaven's Jade Emperor bestowed him the role of distributing earthly wealth and assisting the earthly man to chase back any bad debts. Hence he is often prayed for abundance, prosperity and wealth luck for careers, sales and businesses. For those in business, his presence will ensure all bad debts to be returned without much trouble. Military God of Wealth powerfully sits on a tiger that bows to him and a pile of wealth and has a fierce look (but calm). He carries a big gold ingot or wealth pot and his own special unique multilevel varja weapon that looks like a sword (as he used to be in the military). Military God of Wealth is essential for business success when carefully placed important areas. He not only create abundance in wealth, but also protect your existing wealth ownership. Note: Kindly do not play him on floors, bedrooms, kitchen and toilets.